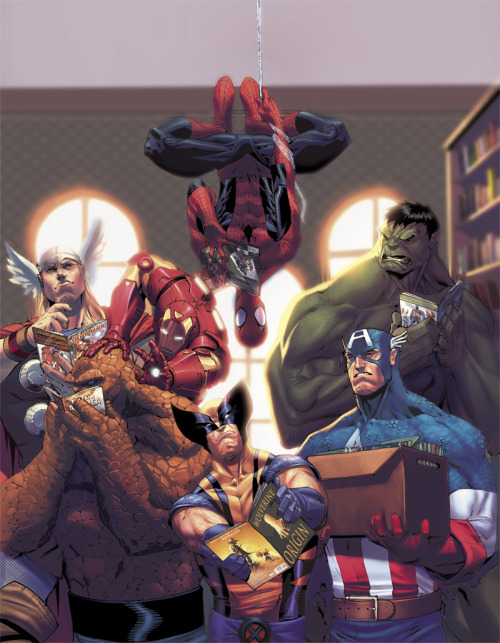 "So, this is my first Marvel cover ever. I loved doing this cause for the first time I had the chance to draw all the Marvel main characters that I love (no FF...I'm not a big fan after "those" movies) It was just a very special experience to finally say " i'm drawing Marvel characters for Marvel" finally after so many years of dreaming of it and sitting in my room when I was a kid coping comics...i'm finally there!" News: Dark Horse is planning to beef up its lineup of children’s graphic novels with four new titles for 2015: Rexodus, a story about dinosaurs from outer space, and three older properties, Rod Espinosa’s Courageous Princess, Samuel Teer and Hyeondo Park’s Veda: Assembly Required, and an adaptation of Roald Dahl’s The Return of the Gremlins. 13 Dimensions of MULTIVERSITY: DC Worlds We Want Brought Back! Researcher and filmmaker Robert Emmons talks about his new documentary, Diagram for Delinquents, which looks at Fredric Wertham and the comics scares of the Fifties. Sci-Fi Meets Murder Mystery in Image Comics' "The Fuse"